There is nothing more pristine and wonderful than historic waterfront communities anywhere in the world. Located on Baltimore's historic waterfront in the heart of Fell's Point, the Admiral Fell Inn, an Ascend Hotel Collection Member is a boutique hotel offering timeless charm and modern amenities. Our amazing property is found in a location convenient to Johns Hopkins Hospital and Johns Hopkins University. The Admiral Fell Inn is located in a premiere Fell's Point location which places you just steps from Baltimore's best dining, entertainment and nightlife. Another one of the famous locations nearby is The Horse You Came In On Saloon; this place is one of the last spots that Edgar Allen Poe was seen alive.When you stay at the Admiral Fell Inn, we want you to be connected from the moment you make your reservation until you're ready to come back and see us again! Your Experience Specialist is more than just a concierge. She is ready and waiting to help plan your trip and to help make the most of your stay by connecting you to the very best that Baltimore has to offer. 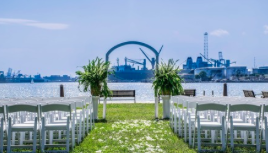 The Waterfront Promenade is the perfect venue for an intimate wedding. This peaceful outdoor venue is adjacent to our gallery and hotel lobby. intimate wedding parties and rehearsal dinners. Guests can reserve our 38-room boutique hotel for a private parties, intimate events and retreats. Our historic accommodations, beautiful event spaces and staff will cultivate a enjoy a one-of-a-kind experience. Up to 150 people with 10 round tables. Accommodates: Up to 80 guests with rounds of 10 and 125 for a cocktail reception.